Carriage Glen at Anderson Creek Club is an active lifestyle neighborhood in an expansive master-planned community set among 1,700 acres of beautiful pine forest in Spring Lake, North Carolina. Homeowners enjoy access to a truly impressive set of amenities including an 18-hole golf course, massive amenity center, and a private club house for the exclusive use of Carriage Glen at Anderson Creek Club residents. There are also acres of parks and natural spaces, miles of walking and jogging trails, and a total of 19 lakes and ponds. There are just 91 single-family homes in Carriage Glen at Anderson Creek Club. Homeowners enjoy plenty of free time with community maintenance and lawn care provided. Fayetteville is the nearest large city and is also home to Fort Bragg which means there are plenty of shops, restaurants, and other services just a short drive from the community. 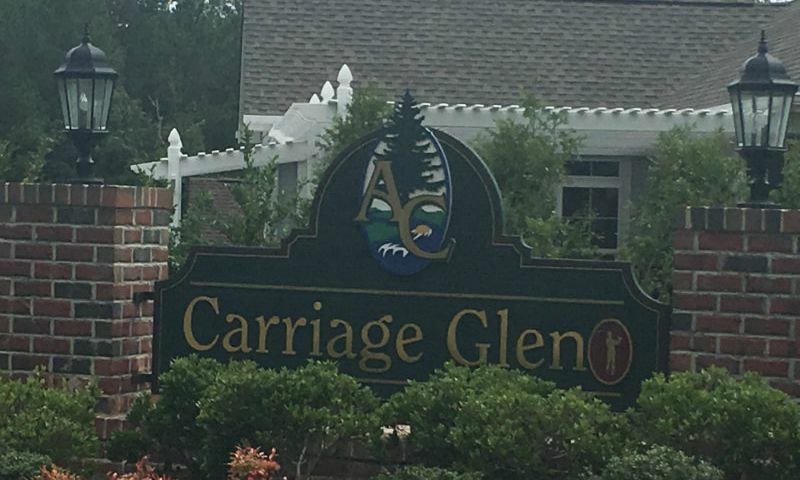 Living at Carriage Glen at Anderson Creek Club not only means having access to the master-planned community's expansive amenity center, golf course, and acres of manicured parks and natural spaces but also a private clubhouse reserved exclusively for the residents of this 55+ neighborhood. This private clubhouse has an exercise room, game room, multi-purpose room, and catering kitchen that make it ideal for hosting social gatherings or private family events. Outdoors, a pool and patio are perfect for enjoying warm, sunny days. The entire master-planned community is built around a beautiful, 18-hole golf course designed by PGA Pro Davis Love III and was named "Best New Course in North Carolina" by Golf Digest upon its construction in 2001. The course offers discounted single games and memberships to homeowners in Anderson Creek Club. A stunning clubhouse is home to The Bar & Grill at Anderson Creek, a fitness center, meeting and conference facilities, and a pro shop. The nearby Inn at Anderson Creek has guest lodging available for short of long duration stays, perfect for when family comes to visit. There is also a pool house with locker rooms along with an outdoor pool and patio. Patriot Hall is a secondary amenity center that houses most of the community's other amenities. Along with a fitness center and library there are numerous meeting and class rooms that play host to the huge variety of club meetings, community gatherings, and educational lectures and courses that promote ongoing learning. A large outdoor pool and patio round out the offerings at Patriot Hall. Epcon Communities, H&H Homes, and McKee Homes are building the 91 single-family homes at Carriage Glen at Anderson Creek Club. There are four floor plans available that range in size from 1,643 to 2,930 square feet with two to five bedrooms, two or three bathrooms, and attached two-car garages. Many of the homes in this community are located on Anderson Creek Club's 18-hole golf course. All homes feature first-floor master suites with generous walk-in closets. Gourmet kitchens with spacious center islands are perfect for entertaining guests. Optional bonus suites allow for even more space and can be used as an extra bedroom, home office, or hobby space. Residents of Carriage Glen enjoy will have no trouble finding plenty of opportunities for recreation and relaxation at Anderson Creek Club. There are a wide range of interest clubs that welcome new members like Women's Club, AC Cruisers car club, and Book Club along with special events like wine tastings, progressive dinners, an arts festival and community gatherings on most major holidays. Community gardens along with an annual landscaping competition appeal to homeowners with a green thumb. In addition to covering amenities, common area maintenance, and landscaping, a homeowners' association also provides lawn care at residents' homes. Carriage Glen at Anderson Creek Club is in Spring Lake, North Carolina near Fayetteville. Its convenient location makes routine shopping errands a breeze with a Food Lion just under four miles away. There is a WalMart seven-and-a-half miles away along with a variety of restaurants and other retails stores. In addition to the community's golf course, there are another half dozen golf courses within a thirty minute drive. Nearby Fayetteville is notably home to Fort Bragg and is a regional hub of commerce and activity. Historic Downtown Fayetteville is just 20 miles away offering visitors quaint shops and boutiques, an impressive variety of restaurants, and many churches and houses of worship. There are even more big-city amenities like professional and college sports, museums, and a vibrant arts scene in the Raleigh-Durham metro area which is about an hour away. When long distance travel is required, Raleigh-Durham International Airport is 64 miles from the community. Homebuyers looking for a low-maintenance home in the standout master planned golf community will surely be impressed by Carriage Glen at Anderson Creek Club. There are plenty of activities available in Carriage Glen at Anderson Creek Club. Here is a sample of some of the clubs, activities and classes offered here. 55places.com is not affiliated with the developer(s) or homeowners association of Carriage Glen at Anderson Creek Club. The information you submit is distributed to a 55places.com Partner Agent, who is a licensed real estate agent. The information regarding Carriage Glen at Anderson Creek Club has not been verified or approved by the developer or homeowners association. Please verify all information prior to purchasing. 55places.com is not responsible for any errors regarding the information displayed on this website.